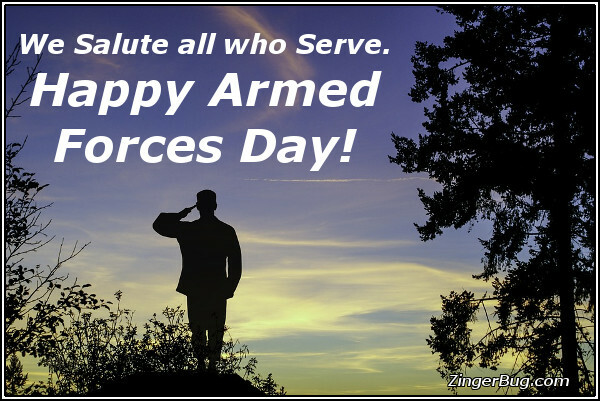 Armed Forces Day celebrates all of the branches of the United States military. Army, Navy, Air Force, Marines, Coast Guard National Guard. The holiday was first celebrated in 1950 during the Truman administration and replaced the previous separate celebrations for the Army, Air Force and Navy. Armed Forces Day is the perfect time to show your support for our men and women in uniform. These comments are perfect for posting on Facebook, Twitter, or any other friend site or blog. If you have friends or loved ones serving in the military, send them some support. Or just show your support for our troops by adding these graphics to your profile.